Welcome to the QuikRead go® software update site. Here you can download the newest available QuikRead go software version to a USB storage device that you can use to update your QuikRead go Instrument software. In order to serve you as well as we can, please follow the steps below. In case you need support for the QuikRead go Instrument software update, please first check the Frequently asked questions list (link below). In case you need more information, please contact your local distributor or contact Orion Diagnostica by email: orion.diagnostica@oriondiagnostica.fi. This software update site is intended for QuikRead go customers in countries where the QuikRead go system is registered. This version of QuikRead go is not registered in the USA. Do I have to use upper or lower case when entering the serial number of my instrument? 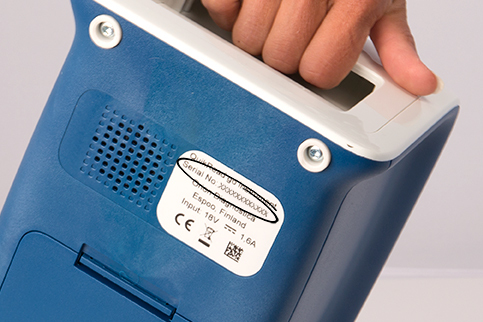 It’s not relevant whether you use upper or lower case when entering the serial number. Should the USB storage device be empty? No, there can be files, but please note that in the USB storage device there should be at least 1 GB of free space. For which instrument is this software update site intended? This software update site is intended for QuikRead go Instrument customers in countries where the system is registered. This version of QuikRead go is not registered in the USA. What features does the QuikRead go Instrument software version 7.6.2 contain? I have downloaded the software package into the USB storage device but the QuikRead go Instrument does not recognize the storage device (no USB-icon in the display). What I should do? The USB storage device is defective or is not in the FAT32 format and partitioned as the primary partition, marked as active. Try another storage device or format your storage device. Where can I find the instrument serial number? The instrument serial number can be found on the bottom of the instrument. See the image on step Enter your instrument serial number. How many times can I download a software version for one QuikRead go instrument? You can download a newest software version twice for a same instrument serial number. The count will always be reset when a new software version is published and uploaded to the site, so you will be able to use the same serial number again. Your location is not in the USA. Are you sure about your choice? This version of QuikRead go is not registered in the USA. Software update is neither possible via this website from the USA. The instrument serial number can be found on the bottom of the instrument. Please fill in the contact information. The information that you filled in is incomplete or not correct. Please check the information. Download the newest software version to a USB storage device. After downloading is complete, remove the USB from your computer. Insert the USB into one of the USB ports of your QuikRead go Instrument and start Settings - Measurement flow - Maintenance - Software update. Size of the USB storage device should be 1 GB or larger, it should be in FAT32 format and partitioned as a primary partition, marked as active. Before downloading the new software version into the USB storage device, please make sure that your QuikRead go Instrument detects the USB sorage device. You can do it by inserting the USB to one of the QuikRead go Instrument's USB-ports. A USB icon will appear on the display when detection is ready. 1. The downloaded files are compressed in an archive folder and need to be extracted to the USB storage device. Navigate to your Downloads folder where you will find the downloaded software folder. Different browsers may have slightly different commands and names for archive folders. Note: Don't change any of the file or folder names when downloading the files to the USB. The name of the folder should be "qrzwupdate". 2. Right click the downloaded folder and select "Extract all”. Select your USB and extract the content there. “Extract all” -command can also be found in: Open with -> 7-zip. Here you can find a more detailed instruction for extracting the files. Read the instructions of use on uploading the software or watch the video on YouTube. Please fill in the region, serial number and user information as required above. If you have lost your admin password, you can request a temporary Admin password here. The temporary password can only be used once and is valid for one week. PLEASE NOTE Use upper-case letters in the instrument serial number. When entering the temporary password to the QuikRead go, pay attention to upper and lower-case letters. Lower-case letters can be found behind the Abc button in the QuikRead go virtual keyboard. You have already downloaded twice.